This full-length installation video can be used by homeowners, masons and other installers. Installation should be done by a professional mason. Individual stones are heavy and may need two or more men to lift some of the pieces. Extra caution should be taken as dropping or lifting these stones can cause personal injury or death. The edges are fragile, extra precaution should be taken not to rest weight on them. There are many ways to install that are acceptable and we certainly do not mean to imply that this is the only way. Old World Stoneworks is not responsible for the quality or safety of the installation. The first and important step in the installation process is the unpacking of the stones. 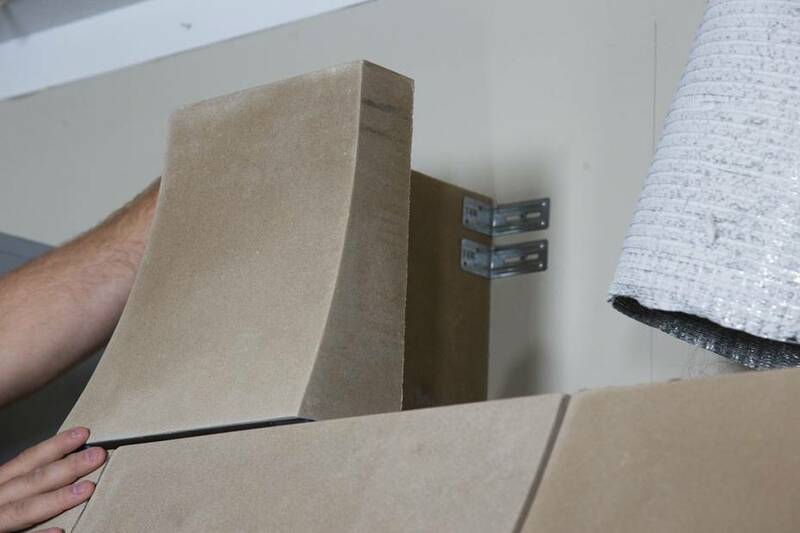 Being very careful with edges and corners, lay out all pieces on styrofoam, cardboard or plywood, checking for any damage that might have occurred during shipment, but most importantly to check and verify that the dimensions are correct. It should be laid out with ¼” spaces between stones. Installation is handled like any installation of exterior cast stone. We suggest using brick ties or “L” brackets to anchor to wall, screw brick ties or “L” brackets into stone with masonry screws. We strongly recommend using “L” brackets to support lintel stones. If you install to drywall make sure to anchor into studs. Use mortar between stones and between stone and wall. Use 1/4 inch plastic shims between stones to make joints equal. Level each piece as you go up. Before grouting, saturate the stones with water. This is very important. Stone is porous, if not saturated with water, lime will leach out of the joints on stone and make a very fuzzy joint. The stone must also be cleaned as you grout otherwise risk permanent discoloration. Use regular white mortar mix type “N” for installing. Do not use grey mix. Mix 3 parts sand 1 part white mortar mix. If you are unable to get white mortar mix in your area use a formula of 3 parts sand, one part lime, and one part white Portland cement. It is also important to clean the stone as you grout. An acid wash is most likely not necessary based upon this method of installation. However, if stone appears to have a milky white haze on the surface after a week from completion you may want to consider an acid wash. If an acid wash is necessary we recommend a solution of muriatic acid and water (7 parts water to 1 part muriatic acid), put in a spray bottle. Check the warning label on the muriatic acid container. Wear rubber gloves & goggles and make sure area is well ventilated. Cover areas that can be damaged such as carpet, finished walls, etc. Work on a small area at a time. Wet the stone first. This is very important so you do not etch the surface of the stone. Apply acid solution and let sit for less than a minute. Then rub stubborn stains with a brush (do not use metal brush) and rinse with clear water. This should get rid of stains, smudges, and some mortar splashes. Repeat application for stubborn stains. Cast stone can take several weeks to dry evenly. We recommend that you seal all range hoods since they will be subjected to cooking splatters. A sealant will aid in the cleaning process of stone. We suggest a product called Prime-a-Pell 200. You may call Chemprobe Corp at 800-863-6321 to order your sealant. Use a foam tip applicator to apply. Not a paint brush. Our clients have reported that it is impossible to see once dried and it does not yellow. Other products recommended to seal limestone will probably work as well. If you plan to seal, please do so after installation and cleaning. Remember to allow the stone to dry first.